Is smoking a conscious decision you make or has it become a natural part of your daily life? Do you still feel you have control, or is it finally time to break off your toxic relationship? Sponsored by the WHO, this No Tobacco Day encourages smokers around the world to go smoke-free for 24 hours. It also highlights some of the regulatory issues surrounding the trade in tobacco which many consumers may be unaware of. This year the event will take place on 31st May and will call for plain packaging of tobacco products. Although the day has a clear legal motivation – to get Member States to pass plain packaging laws and strengthen restrictions on tobacco advertising – raising public awareness of activity within the tobacco industry is central to its mission. Australia has paved the way for plain packaging, implementing it in full from December 2012. The UK, France and Northern Ireland are all following suit, committing to passing plain packaging laws this May. The dangers and effects of smoking are well established. Smoking is the single most important preventable cause of death and illness in the UK, and feeds into a whole host of serious health problems. It causes premature death in 50% of all smokers, and approximately 100,000 people in the UK die every year as a result of the habit. The difficulty in quitting smoking is equally notorious, although there are various resources available to help those committed to quitting. Whether attempting the 24-hour break from smoking or looking to kick the habit once and for all, the following tips could help you regain control over your health for the better. Do you smoke when socialising or as an accompaniment to drinking? Are cigarettes a comfort or a means of relieving stress? Do you associate your weight with smoking? Analysing the core compulsion behind your habit can reveal issues that may need to be addressed using a different approach. Think about times when you felt you really needed a cigarette and try to justify the urge. Identifying what values you attach to smoking may also give you focus for quitting, such as learning to manage your weight healthily or setting time aside for a relaxing hobby. Think about what provokes you to smoke and what challenges you might face when attempting to quit, so that you are better prepared to deal with them. Anti-smoking medication exists to help suppress nicotine cravings which can take about a month to subside. Prescription medicines that do not use nicotine are also available, reducing cravings by stimulating the nicotine receptors in the brain and making smoking less enjoyable. 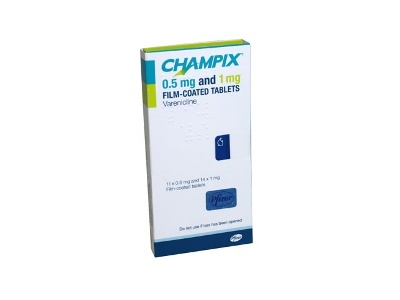 Medicines such as Champix can be used alongside NRT and have been shown to increase your likelihood of quitting by 300%. There is no single medication that works for all smokers and they will not completely remove withdrawal symptoms, so you will still need plenty of focus and dedication to quit. Additionally, pregnant women should discuss all types of medication with a doctor before starting a course. Kicking a habit that you’ve worked into your routine can be very difficult, especially when it’s attached to regular social events. To help keep you mentally on-track, set a date to quit smoking and have a goal in mind that you can work towards. This could be going smoke-free whilst training for a sponsored run or marathon, or not smoking in the run-up to a wedding or birthday. In addition to setting milestones, some people find it useful to keep a smoke-free diary to keep focus. Whilst charting your progress this also encourages you to write through tough withdrawal experiences, rather than dealing with them internally. Set a goal, acknowledge your progress, and stick to it. Going it alone can be an extremely challenging task for those trying to quit smoking. Like any challenge, it is reassuring and motivating to receive support from other people. This could take the form of one-to-one or group support sessions, signing up to a ‘stop smoking’ program, having a conversation with your GP or pharmacist, or calling one of the various stop smoking helplines. Try getting a ‘quit smoking’ app for your phone and connect with others trying to quit. Alternatively, try quitting with a friend so you can lend support and focus to each other. For support that really matters, try involving your friends and family in your goal. Sharing the burden and reaping the emotional rewards of quitting can be invaluable to smoke-free success. Fingers twitching for a cigarette and wondering if one more will make a difference? Nicotine cravings increase in intensity for up to 3 minutes and then subside, so be sure to distract yourself from breaking your golden streak. This could be through changing your environment, substituting a cigarette for a healthy snack or drink, or phoning a friend when the urge arises. Introducing healthier new habits into your routine can also be an effective longer-term solution. Regularly going for a run, for example, is particularly rewarding; not only are you replacing a dangerous habit with a healthy one, but you are directly improving an area of your health which smoking did so much to endanger—cardiovascular health. Always check with your doctor before embarking on any new exercise programme, however. For further motivation, remember that smoking is the leading behavioural risk factor for developing cardiovascular disease (CVD), and is directly linked to erectile dysfunction, high blood pressure, and high blood cholesterol. The chance of developing these problems can all be significantly reduced through regular exercise. Let’s face it, there’s nothing glamorous about going through the motions of quitting smoking: you just ate a carrot stick at your desk instead of going for a smoke, and nobody even realised. Replacing the kick you got from nicotine is itself a rather tall order. To keep up motivation and hold temptation at bay, be sure to treat and reward yourself as much as possible. When you have an urge to smoke, try doing things that immediately target the pleasure centres of your brain and release endorphins. One activity in particular springs to mind, although when this is not practically possible try indulging in smaller treats. For the longer-term, think of the money you will save by not purchasing cigarettes and save towards something big, such as a holiday, event, or new toy. Through association, your brain may come to associate not smoking with pleasure. It may seem a little far-fetched, but reward can be extremely positive when you are denying yourself of something. Need help to quit smoking for 24 hours? Go for gold and try going “smoke free” for 24 hours this May. If you’re committed to quitting, why not take this opportunity and set World No Tobacco Day as your date to stop smoking? What is Male Infertility?Is Man Flu Real?